FitnessSyncer Notebook is a health and fitness tracking system to include your data that is not already in a cloud. FitnessSyncer Notebook makes it easy for people moving paper notebooks into the cloud and easy for family and/or physicians to keep an eye on a loved one’s vitals. There is an easy-to-use interface for entering in your information which can then utilize all FitnessSyncer features. As well, it is a simple way to get started and see what FitnessSyncer can offer. To get started, click the Create a New Entry () button. 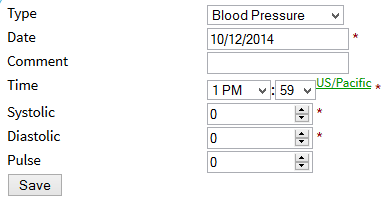 Once there, select the type of entry, and populate as many of the data fields as you can. Click Save to save the entry. Once you have an entry, you can see the data on our Dashboard, or you can click the Print () button to print a version of the data for your physician or select Export CSV () to download a copy of your data. In addition to filling out the data, you can also upload GPX, TCX, KML, KMZ, PWX, FIT, or CSV files which will be parsed and automatically added. If you have a third-party device which generates these types of files, consider downloading the FitnessSyncer Uploader which can automatically upload this data from your desktop to FitnessSyncer. Once in a while, some providers will remove support for some data types. When that happens, you can also add a Source from that data and then add a Sync Destination to FitnessSyncer Notebook to copy those items into the FitnessSyncer Notebook. That is a great way to not lose access to your data! FitnessSyncer Notebook makes it easy for people moving from paper notebooks into the cloud and easy for family and physicians to keep an eye on a loved one’s vitals.